"In this CD Namaya celebrates and honors Mother Earth as Healing Muse, "…sublime joy when reality and imagination blend…" he says. Namaya, poetic visionary, as I listen to your meditative, clear voice, soothing background music and bird songs, I find myself sitting next to you on Heron Pond, my eyes full of sky and lake and weather, my soul grateful for the beauty of our precious planet. L'chaim, and thank you!" "I am resting and what better way to rest than hearing your soulful voice moving me to tears. Thanks T. Truly beautiful." "...listening to your smooth, hypnotic voice in my ear. So much of what you do came together for me when I heard this. The music for "Li Pon" was perfection (as was the music for "Autumn Whole"). Your voice is stunning, as is your rhythm. This recording is really a bit of magic - almost like a song. Makes me dreamy... "
"I enjoyed Vermont My Home very much. The fact that nature is central to the collection adds to its playful, meditative spiritual quality"
"Really beautiful! I like the smokiness of your delivery, and the production is very high-quality, too, with the music and sounds." "It is great music, it enlightened my day." "It is a need in the midst of so much suffering in our world. Muchas gracias!" 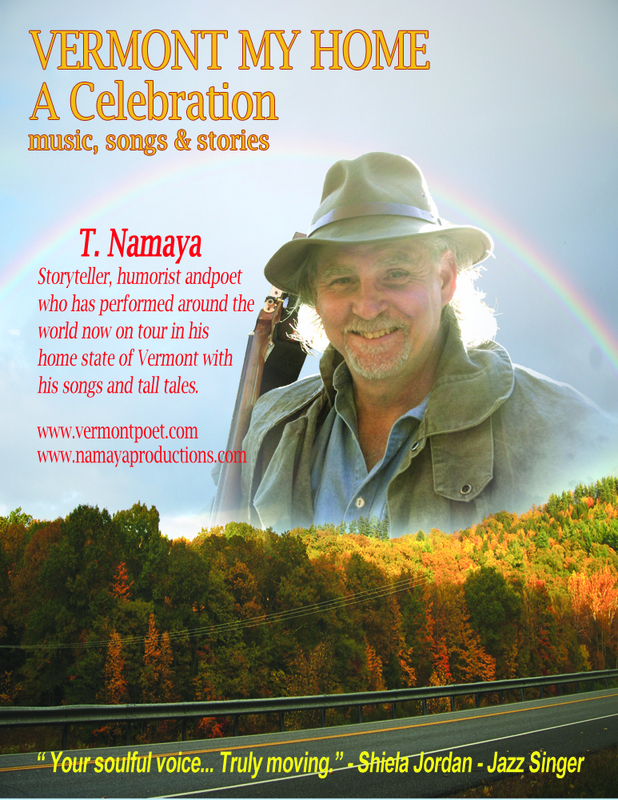 Copyright Namaya - Vermont Poet. All Rights Reserved.